Christmas is basically the best thing to ever happen to planet Earth. I mean that in every sense of the word: we have a Savior thanks to Christmas. Also we have lights and trees and garland and happiness. People just seem happier this time of year. 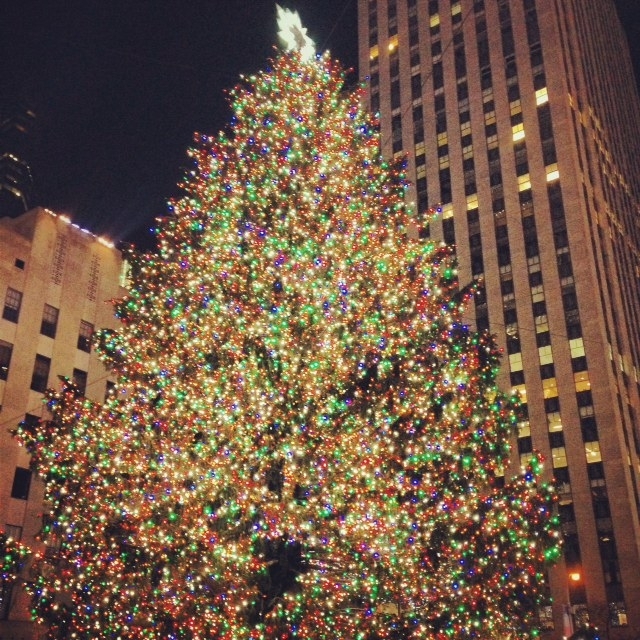 One of my favorite things about NYC is how this city shows up for Christmas. I first visited around Thanksgiving when I was 13, and I just remember the size of everything. It all seemed so magnificent and big. The buildings are big. The stores are big. The Christmas trees are big. There’s one tree in particular that is really big. Rockefeller Center is always one of my favorite places (go ahead, judge me for the waning tourist & poor New Yorker that I am!) But at Christmas, even Rockefeller outdoes itself. I was at a holiday party last night near Times Square and as I headed for the 1 train I realized how close I was to the tree. Without hesitating I changed my path to go and stare at it. I knew it would be crowded; it’s freezing cold. But I had to get a glimpse and this weeknight was my perfect chance. I was composing my Instagram caption as I walked (ahem. you do it, too) and was almost embarrassingly excited about this excursion. As soon as I arrived at the tree I pulled my phone from my coat to snap a few pictures. Selfies aren’t always my thing, but I was about to make an exception. I snapped one of the tree before the annoying pinwheel surprisingly popped up – my phone battery was finished for the day. Crap. I immediately turned on my heels to leave. To go home after looking at the tree for all of 5 seconds when I had excitedly braved the cold and extra 10 minute walk for this. I was a few feet into my return when I realized what I had done. Just because I can’t take a picture doesn’t mean it didn’t happen. Ouch! When did I stop believing that? Thankfully I realized this and returned to my post to stare at everyone’s favorite Christmas tree for several great, cold minutes. Everyone around me was from out of town, just as excited as me to see all the lights and take in its’ size. I soaked up their energy and awe of NYC while we shared an amazing sight to behold. I’m grateful I had this realization. I am not criticizing social media – that would be too easy and very short-sighted. Rather I am thankful for the reminder that moderation is a very good thing. While soaking up this favorite season in my favorite city, I’m pausing to take it all in. Even if I am the only one who sees it. I mean, isn’t it just beautiful?